New Creston Barrel Cider is so named because the apples come from the Creston Valley of British Columbia. Creston is known for the wide variety of apples grown there, and this is a key factor in the making of superior cider. When I first started making hard cider I would buy a few gallon jugs of apple juice from the likes of Trader Joe’s and Whole Foods, pitch some yeast, wait a while, and decide I really didn’t like hard cider very much. Then I discovered blending. Mixing the juice from several varieties of apples creates the full-spectrum experience that is typical of complex recipes. 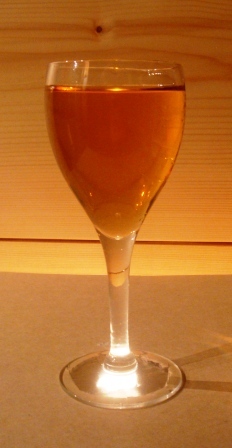 In the case of hard cider, the blend of juice should include sweet, tart, bitter and aromatic apples. For traditional barrel cider, the sensation of umami can be created with an addition of grapes and grains. New Creston Barrel Cider starts with a blend of Jonagold (tart), McIntosh (aromatic) Spartan and Gala (sweet) apples. To add umami I took 25 grams of Sultanas and 25 grams of Malawi “Sucre de Canne Brut” per liter of juice, added 12.5 grams per liter of cracked dark wheat malt, and simmered these in South African Muscat grape juice for 20 minutes. I added this mash to the fermenter, and noted that it would make a terrific breakfast cereal! I’ve recently found that unpasteurized Creston apple juice will ferment nicely with its natural yeast, but it can be a risky proposition with unpredictable results. For this batch I pitched a starter of White Labs WLP720 Sweet Mead yeast in malt powder with a little yeast nutrient. As barrels are a pain to use and maintain, I’ve added barrel flavor to other batches by using French oak chips. For this version I left them out. Instead, when fermentation was complete and the cider well-aged, I added crab apple syrup made with equal parts of crab apple juice and sugar. This gives the cider the tannic, bitter principle of a full-spectrum blend, with a semi-sweet flavor. With three years of aging, it’s a beautiful cider, with a lovely apple aroma, super clear, sweet, yet still tart. The sultanas give it a moderately full body, and the wheat provides a soft finish. Luscious. This entry was posted in Uncategorized and tagged ale, beer, fermentation, hard cider, homebrewing, New England Barrel Cider Recipe, umami.